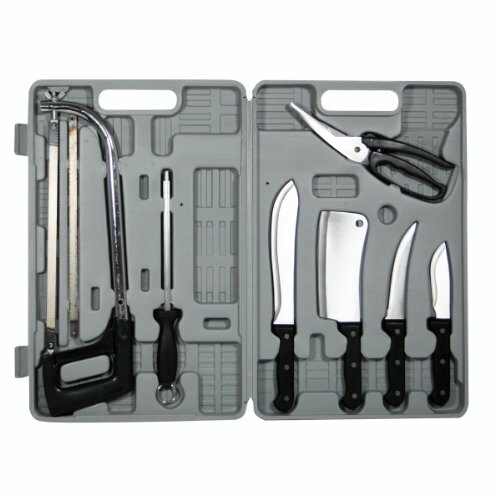 The 10 Piece Knife Set is made from made from professional quality durable 1. 5mm stainless steel with ergonomic plastic handles, all packaged within a convenient storage case. Clean up is a breeze with these dishwasher-safe knives. 18.75 in. L x 11.75 in. W x 2.25 in. H (6 lbs). The Sportsman Series 10 Piece Professional Quality Butcher's Knife Set has everything you need to clean and process game and fowl at home. Hunters and anglers will want this Knife Set to clean and butcher wild birds, fish, turkey or deer. The Sportsman Series 10 Piece Professional Quality Butcher's Knife Set has everything you need to clean and process game and fowl at home. Hunters and anglers will want this Knife Set to clean and butcher wild birds, fish, turkey or deer. If you have any questions about this product by Buffalo Tools, contact us by completing and submitting the form below. If you are looking for a specif part number, please include it with your message.